That is a rhetorical question BTW. Last weekend was the fifth year anniversary of my college girlfriends and I getting together to celebrate another year of friendship and life. You can see previous trip recap posts here & here. We met up in Las Vegas, a relatively cheap place for the eight of us to fly to from across the country. Also because of the Mariah Carey residency. Somehow though after landing on our weekend we didn’t consider checking on Mimi’s schedule, sadly she wrapped up in February so we had just missed her. But, without Mariah there was still a lot to look forward to: spa time, fun dinners, sunshine and catching up vis a vis lots of conversation and lots of laughs. Selfishly I was wanting to talk all things skincare, fine lines & wrinkles, eye creams and lotions and potions and at our first dinner we jumped right in. I love that we are all in this season of life where we are all more or less experiencing the same things. I am very happy to report that all of the above happened. 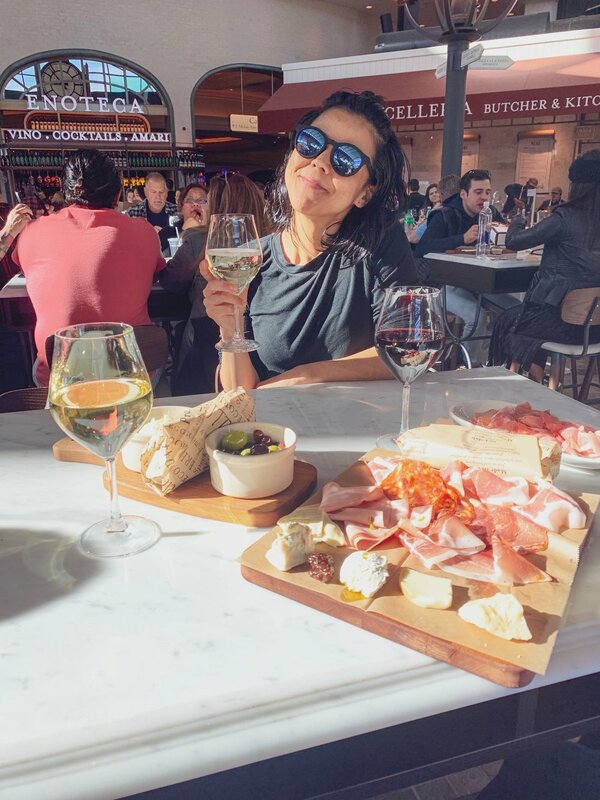 This time around we organically opted to do more small group activities, a couple of us would do wine in the afternoon while others would want to shop or do blowouts. But each morning and evening we regrouped for big meals together. And the girls even convinced me to get my first facial ever, here we are at the spa. On our last morning all together my friend Meghan who could be described as a free spirit in rose colored glasses interrupted our brunch conversation and asked each of us to think on a ‘brag’ a ‘gratitude’ and a ‘desire’ to share with the table. Each year Meg comes with homework for us all to do. It is always reflective and the time allows for us to connect on things with maybe more purpose or weight than a years worth of conversational catch up can provide. It also allows us to provide guidance, support and motivation for each other. Our brunch was set in a Feminine French style restaurant called Primrose. It was sweetly decorated with florals and beautiful colors. Over mimosas, rose and the most perfect pancakes ever we all went around the table sharing our ‘brags’. Each of us spoke about something different: asking for a raise at work and finally receiving it, tremendous weight loss, newlywed bliss, surviving a demanding career x motherhood x marriage, owning up to depression and taking care of yourself, staying committed to trying new things. After each of us said our piece we enthusiastically would disrupt into applause. It felt so good to say something you were proud about in front of a group of women who were proud for you too. I will hold onto this feeling for a long long time and will try to repurpose this activity in the places and spaces where I find myself in the company of women. Thank you Charisse, Jenna, Ashley, Meg, Sarah, Katie and Llo for another wonderful weekend.